the face of white privilege starts here | What's that you said? 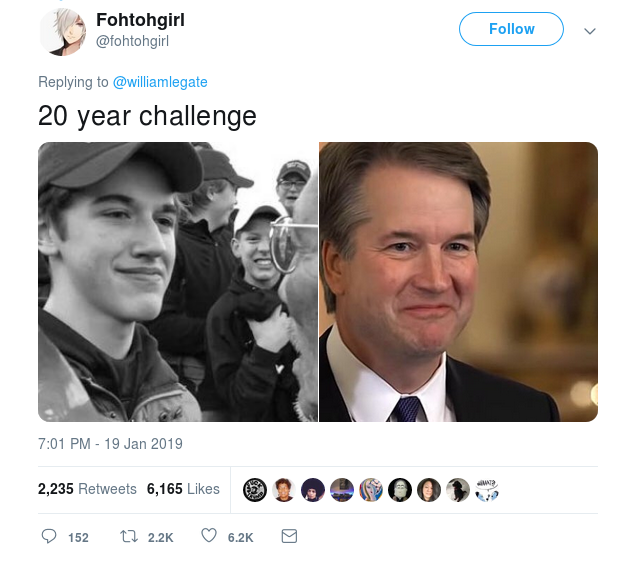 The strangest thing is that fotohgirl@twitter circulated this picture and I honest to god thought it was part of that 10/20 year challenge thing, having missed the context in which it was posted. Vincent Schilling: What were your thoughts regarding the disrespect being shown by the youth? You gotta do it a certain way. We have protocols. Nathan Phillips: I’m angry with those instructors, the chaperones and tutors whose children’s lives were in their hands. That was their job, that wasn’t my job to do. No, but then again, we are Indigenous and it is my job and from an Indigenous point of view. But they were getting paid to take care of those children to act and for them to be allowed to behave that way. Is it in my mind, is a fireable offense. They’ve aligned those children to take the wrong path and they have a bright future to live. You know, if that was my child, I would not be happy with the school officials right now to allow my child to behave that way. I don’t care if my child is that way. When he’s out in public, he’d better behave. This entry was posted in Fighting Bigotry and tagged bigotry, catholics, indigenous, native americans, privilege, racism, veterans, white supremacists. Bookmark the permalink.